In an automotive industry that offers American buyers hundreds of different options, few models have the immediate name recognition of the compact Toyota (7203.T-JP) Prius. When it debuted in Japan in 1997, it became the world’s first mass-market hybrid electric vehicle and demand exploded when it reached the U.S. three years later. The Prius delivered around 50 miles a gallon and had far more interior space than the typical fuel-saving minicar — all at an affordable price. That made it the best-selling car of any form in California, and the best-selling hybrid vehicle worldwide earlier this decade. But, as an updated 2019 version of the Prius gets ready to roll into U.S. showrooms, Toyota is facing a difficult situation. Sales of the Prius have been tumbling for several years and were down 23.2 percent for the first 11 months of 2018. The new version delivers updates Toyota hopes will revive the hybrid’s momentum, including a new all-wheel-drive system that could improve its appeal in the Snowbelt. But whether that will be enough is uncertain and company officials admit they’re struggling to figure out what to do next. 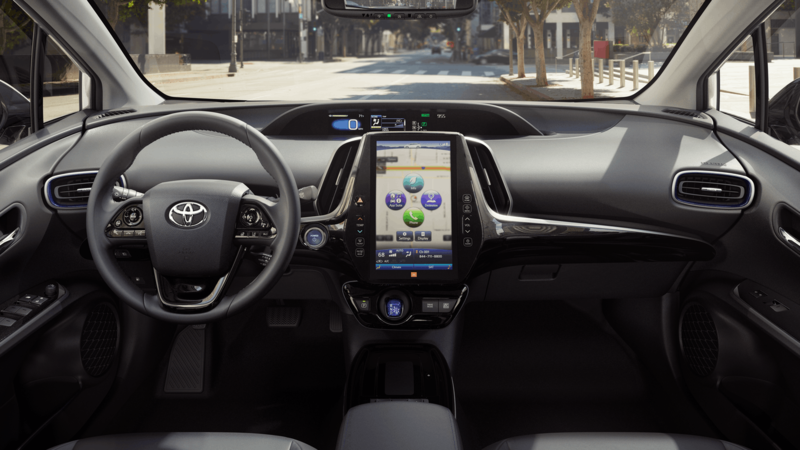 “For the next Prius we have to think about how to … separate [it] from the rest of the Toyota line-up,” Deputy Chief Engineer Koichi Kaneko said in an interview in Kohler, Wisconsin where the automaker was giving journalists a first chance to drive the 2019 model last week. There are a variety of reasons why Toyota sold just 3,180 of its Prius hatchbacks in November. Sales of the entire Prius “family,” including a plug-in hybrid version, are running barely a quarter of its peak. The sharp downturn in fuel prices has scuttled sales of all mileage-minded vehicles. But, as Kaneko alluded to, Toyota has also diluted the appeal of the Prius by now offering hybrid powertrain options on a variety of its more conventional models, such as the Corolla sedan and RAV4 crossover-utility vehicle. The RAV4 is now Toyota’s best-selling American model, last year nudging past the familiar Camry sedan. And some observers believe the hybrid version of the cross-over utility vehicle could out-sell Prius in 2019. As a result, many are questioning whether Toyota even needs the Prius anymore. “Toyota can say the Prius did everything they needed,” said Stephanie Brinley, principal automotive analyst for IHS Markit, helping burnish the Japanese automaker’s green credentials and proving there’s a market for gas-electric drivetrain technology. For now, at least, that’s not something Toyota plans to do. And the 2019 model shows that the automaker is looking for ways to revitalize the hybrid hatchback’s appeal. That includes some modest tweaks to interior and exterior design responding to wide criticism of the fourth-generation model after its 2016 model-year debut. The system is a simpler version of the all-wheel-drive technology found on some products and works only at relatively low speeds, but it helps Toyota maintain Prius’s position as “an affordable hybrid.” A base model starts at just $23,770, and versions with all-wheel-drive start at $26,380. KOHLER, Wis. — Depending on where you live, the unavailability of all-wheel drive on any certain car model could be a deal-breaker. Whether they need it or not, some people refuse to go without, even if they’re not concerned enough to switch to snow tires when they set their clocks back an hour in the fall. Having four driven wheels won’t make you stop any quicker on ice, but the “AWD” badge on the back instantly adds 15 confidence power. If the lack of all-wheel drive has been what’s kept you from enjoying the impressive efficiency of a Prius hybrid, Toyota has something new it’d like to show you. Toyota unveiled the 2019 Prius AWD-e at the 2018 Los Angeles Auto Show. With 50 miles per gallon combined, it’ll be the most efficient all-wheel-drive vehicle you can buy without a plug when it goes on sale in January 2019. For those who swear by high mpg but want AWD (or vice versa) this is a great thing. The Prius nameplate has been a go-to for those who want a car that’s economical both up front and at the pump. Now, those four-wheels-driven stalwarts in the Snow Belt can enjoy similar frugality. Not only that, but Toyota has listened to the masses and scaled back the visual weirdness for 2019. The updated lighting front and rear makes this car much more approachable. Inside, gone is the sea of white plastic, which simultaneously managed to look both dramatic and cheap. Instead is more palatable piano black plastic on the center console, the shifter surround and the steering wheel. There have been a couple other minute tweaks, such as placing seat heater buttons in better view near the cupholders, and adding extensions to the sun visors. Finally, the Prius adopts the grade naming of the rest of the Toyota lineup – L, LE, XLE and Limited — with the AWD-e version available in LE ($27,300) and XLE ($29,740) trims. 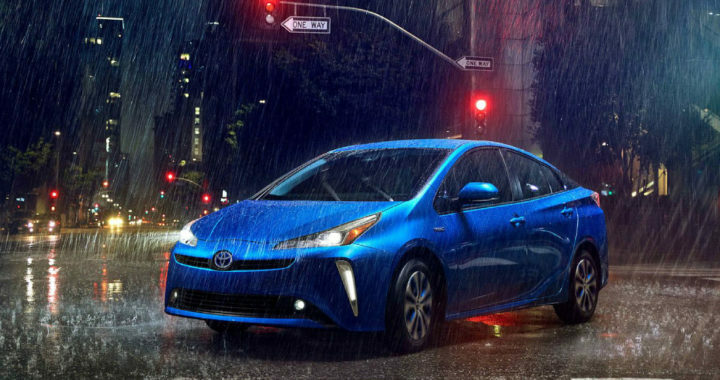 Power to the front wheels comes from the same 1.8-liter gasoline-fueled four-cylinder engine as every other Prius, along with a pair of motor/generators, to provide a combined 121 horsepower. Unlike other Prius models that use a lithium-ion battery pack, the AWD-e instead relies on a nickel-metal hydride pack. Toyota says the battery chemistry switch was made in order to provide superior cold-weather performance. 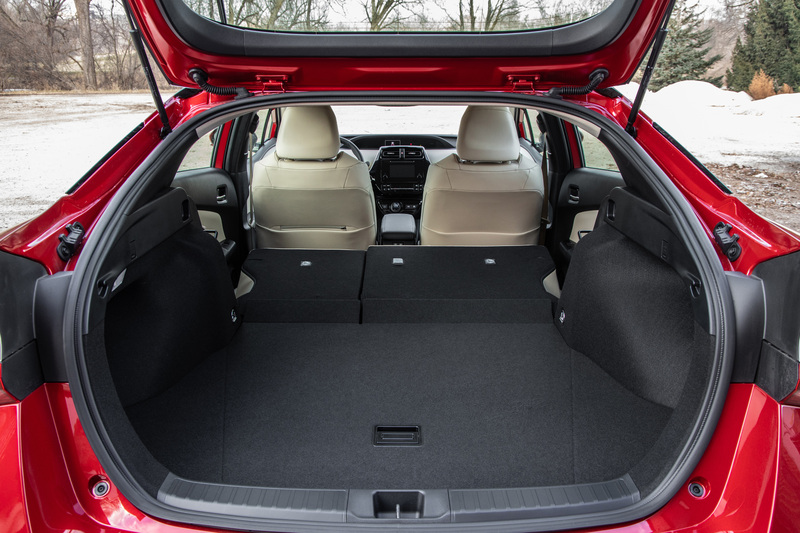 The all-wheel-drive system in this Prius has been engineered to maintain the efficiency customers demand while providing a traction benefit when needed. As such, the rear motor — which supplies just 7.1 horsepower, but a much more significant 40.6 pound-feet of torque — operates independently from the rest of the powertrain. There’s no driveshaft to link the rear axle to the gas engine or front motors. It puts equal power to each rear wheel through an open differential with no mechanical torque vectoring involved, and the wheels can be braked independently as needed to compensate. The rear motor isn’t providing power all the time, either. It’s always on from 0 to 6 miles per hour, helping to pull away from a stop or through a corner with maximum traction (it works in reverse as well). From 7 to 43 miles per hour, it only engages when needed. It’ll also power up in situations where you could potentially lose grip, calculating yaw and speed — say, under hard cornering — to prevent understeer and help keep you on your line. Otherwise the rear motor stays quiet to conserve energy, and the magnet-less design of the motor means it doesn’t add resistance when not providing power. That also means that this motor isn’t used for regeneration; the front motors handle that. Above 43 miles per hour, the rear motor doesn’t activate at all. Toyota says this is not a limitation of the system, but instead a feature or choice in order to provide the efficiency and fuel economy figures Prius buyers demand. As deputy chief engineer of the Prius, Shoichi Kaneko, told us, customers on the colder, snowier Japanese island of Hokkaido were primarily concerned with traction at low speeds, where it could mean holding up a line of drivers behind you at a stop. At highways speeds, the car relies on the same tech as the FWD Prius to provide stability. For our drive, we started by taking the Prius AWD-e out on public roads in and around Kohler. It was cold out — about 25 degrees — but it hadn’t had any snow recently in the area, so our roads were clear and dry. In these normal conditions, the car feels just like a normal Prius. Apart from the few cosmetic changes inside the AWD-e, we could have easily convinced ourselves we were driving the front-drive version. Only when accelerating hard from a stop did it become at all apparent that the rear wheels were being driven along with the front. You wouldn’t notice the tiny bit of bite and shove if you weren’t specifically looking for it. It’s a lack of hesitation that is only apparent in comparison to the standard Prius. Otherwise, in these conditions, it’s the usual Prius experience: an efficient, affordable way to comfortably get from point A to point B. It’s not a quick car by any stretch of the imagination, and that’s clearly not the point. Prius customers aren’t looking for speed. They’re looking for efficiency, and the AWD-e still has it. It offers 52 mpg city, 48 highway, and 50 combined. Compared to the FWD version, it suffers a hit of just 2 mpg across the board. The Prius AWD-e still has Normal, Eco and Power modes to cater the accelerator response to your needs or whims. It also retains the same shifter layout, with a “B” setting that allows for a stronger regenerative braking feel, allowing you to get on the brake pedal later and less often. While we thought we’d appreciate the more direct acceleration feel of Sport mode, more power means more sound from the gas engine up front. After using Sport for a bit, we dubbed it “Groan” mode, and switched out of it. Eco mode, while providing greater efficiency, also makes it easier to drive the Prius quietly, which makes the entire car — and any electrified vehicle, really — feel more refined. With Mother Nature — and the area’s flat geography — failing to cooperate for our test, we took the Prius to a closed circuit where we could simulate the sorts of situations where all-wheel drive could prove more useful. With the help of some snow-making machines and a front end loader, we had a small circuit that turned from asphalt to dirt to gravel to snow, including a hill of snow near the start. We had both FWD and AWD Priuses on hand for testing, each wearing its stock set of all-season, low-rolling-resistance tires on 15-inch wheels. While we weren’t allowed to take the FWD Prius over the hill, we had the chance to take it around the rest of the track a number of times. With a little bit of effort, we could get the Prius to understeer a smidge on the loose surfaces. With enough gusto, we could overcome the nannies and get it to plow more aggressively while cornering through the snow, though it resisted the urge better than we had expected. In the AWD-e, we headed for the snow hill first. We stopped completely on the icy incline. After a moment, we put our foot into the throttle. The Prius paused a half beat, then slowly pulled up and away. It built speed slowly with smoothness and linearity as it climbed, and kept its nose pointed straight as it crested the small but steep hill. We repeated this exercise multiple times that day, and each time was the same: steady, smooth and undramatic. We flogged the poor little Prius harder with every lap of the course. Each uneventful pass through the snow slalom had us taking it a little faster through the slippery curves. On many of the laps, a brave man waited on the outside of a curve with a snowblower to replace the white stuff we displaced as we passed. We could hear the quiet, muffled clicking as the stability control worked its magic, but weren’t able to push the Prius AWD-e into understeer — the higher cornering speeds it allowed over the standard model meant crossing that threshold could’ve potentially meant a bad day for snowblower guy. Or perhaps not at all, depending on how well the car could recover. We weren’t willing to find out; we’ll save that test for an empty parking lot. 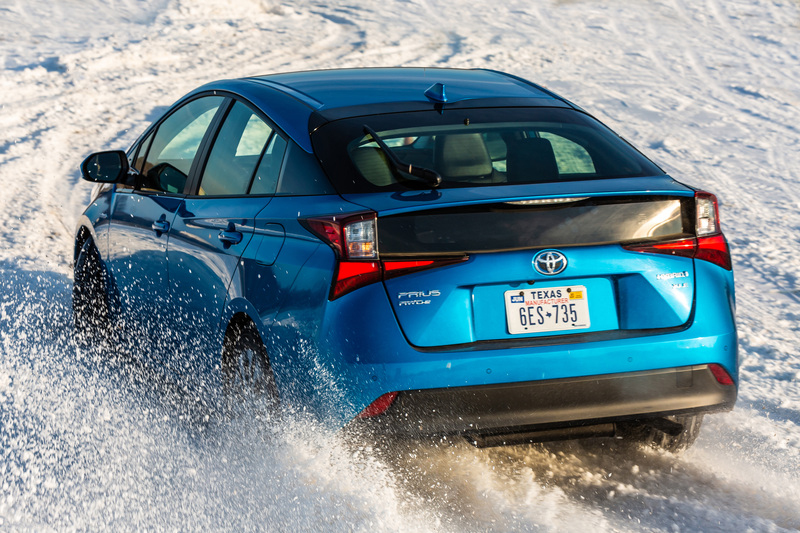 And that’s was when the Prius AWD-e really began to make more sense to us, despite our affinity for snow tires. With all-wheel drive, the car mostly felt the same as any other Prius. It wasn’t adding any huge, tangible change in driving behavior. What it does is subtle and demonstrates itself as a lack of the negatives you’d otherwise notice: slip, instability, hesitation, understeer. That adds up to confidence. And it’s confidence you can appreciate without having to sacrifice much in fuel economy. The majority of drivers never make the switch to snow tires in the winter, whether because of its added cost, a matter of storage space or an issue of fuel economy. Many of them would rather just have all-wheel drive. For them, there’s now a Prius option. Posted in New Vehicles and tagged 2019 toyota prius awd-e price, 2019 Toyota Prius with an AWD-e, 300, The 2019 Toyota Prius AWD-e Starts at $27, Toyota Prius AWD-e, toyota prius awd-e Akron Ohio, Toyota saves breakthrough Prius hybridToyota saves breakthrough Prius hybrid, Will 2019 RAV4 have engine auto start/stop?.